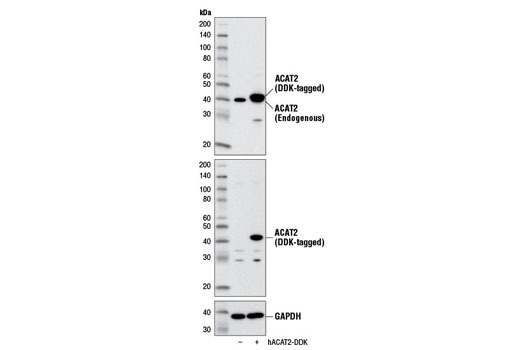 Western blot analysis of extracts from various cell lines using ACAT2 (E1L8V) Rabbit mAb. Western blot analysis of extracts from 293 cells, mock transfected (-) or transfected with a construct expressing DDK-tagged full-length human ACAT2 (hACAT2-DDK; +), using ACAT2 (E1L8V) Rabbit mAb (upper), DYKDDDDK Tag Antibody #2368 (middle), or GAPDH (D16H11) XP® Rabbit mAb #5174 (lower). Immunoprecipitation of ACAT2 from Hep G2 cell extracts using Rabbit (DA1E) mAb IgG XP® Isotype Control #3900 (lane 2) or ACAT2 (E1L8V) Rabbit mAb (lane 3). Lane 1 is 10% input. 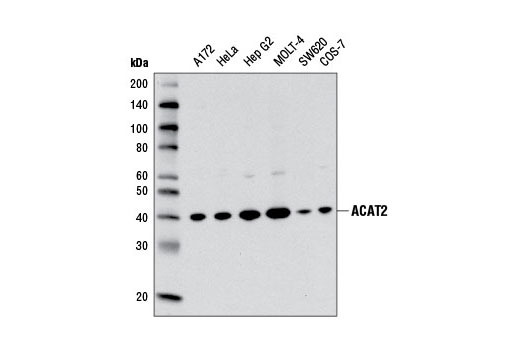 Western blot analysis was performed using ACAT2 (E1L8V) Rabbit mAb. 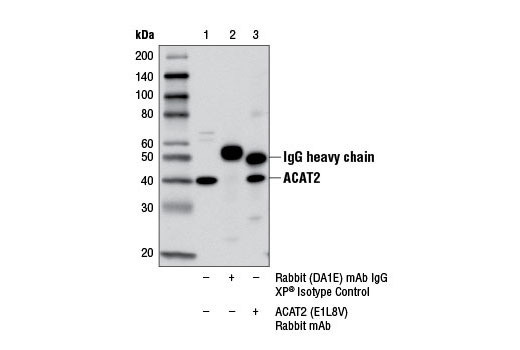 ACAT2 (E1L8V) Rabbit mAb recognizes endogenous levels of total ACAT2 protein. Monoclonal antibody is produced by immunizing animals with a synthetic peptide corresponding to residues surrounding Val216 of human ACAT2 protein. Acetyl-CoA acetyltransferase 2 (ACAT2), also known as cytosolic acetoacetyl-CoA thiolase, plays a role in regulating lipid metabolism (1). It catalyzes the synthesis of acetoacetyl-CoA from two acetyl-CoA molecules, which is later converted into steroids (2). Shintani, S. et al. (1999) Genetics 152, 743-54. Middleton, B. (1974) Biochem J 139, 109-21.